Professional Bikefit at Star Physio using Gebiomized World Class Bikefit Technology. 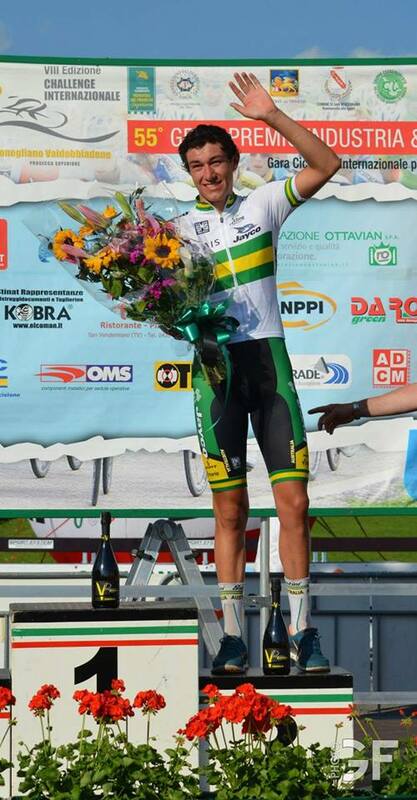 Star Physio are recognised as experts in cycling injuries and prevention as well as performance. We have been providing professional bikefitting services in Perth for over 20 years. Our physiotherapists use the most advanced Bikefitting technology available, including WA’s only dynamic saddle pressure and foot force and pressure analysis system from world leading Bikefit group Gebiomized. In recent years, Star Physio have worked with an international group of bikefit experts to completely revolutionise bikefitting. We now understand that the previous bikefit methods related to “KOPS” (knee position relative to pedal spindle) and measurement of knee angles for bikefit are both unreliable and have little scientific basis. Most bikefitters continue to rely on this outdated and disproven science for the basis of their fits, including those using Retul, BG and Specialized Fit to name but a few. For these reasons, many of the best cyclists and teams in the world are now using saddle pressure and stability analysis combined with high speed motion analysis as the basis for their bikefits. Cycling GB, Sky Team, German Cycling, Trek Segafredo, Orica-Green Edge, Mitchelton Scott and Canadian Cycling are just some of the teams using this technology along with many of the best triathletes in the world including World Ironman Champion Patrick Lange and World Half Ironman Champion Jan Frodeno. This technology is able to accurately assess saddle position, movement and pressure. This is critical to assess and correct in any cyclists getting saddle pain, numbness or discomfort. Without it, we are just guessing! The good news is that our international group agree that 80% of issues with saddle pain are caused by poor bikefit, not a wrong saddle. Please don’t go and spend more money on new saddles before you speak to us! Sadly, this equipment doesn’t come cheap with a $30000 set-up cost for our West Perth Bikefit Studio as well as ongoing maintenance, education and licencing costs, but you will find the results are more than worth it, with a precision fit unlike any other available to help you achieve your goals! In addition, your bikefit at Star is with a physiotherapist, but not just any physio! Out team are cyclists themselves and are trained by the best in the world. We continue to improve our methods according to the most recent research, which we are also involved in producing through work with both Curtin and Notre Dame University. All “bikefit” appointments are physiotherapy consultations which are billed for the extended time required to undertake the incredibly important physiotherapy assessments to assist in determining your ideal cycling position to minimise your pain, improve your performance, and allow you to exercise for lifelong health. This assessment will include questions regarding your history of cycling and any injuries current and or past, your general health and exercise history. We will also discuss your goals in cycling whether they be to maintain good health, fitness and weight, or to take the next step, competing in cycling or triathlon or even chasing a personal or World Record! Following these questions we will conduct appropriate physical assessment related to your history, goals, and our understanding of cycling biomechanics, pain relief and injury minimisation. We will then assess your cycling position and technique and take initial objective measurements on the bike. Using our skills as physiotherapists, we will collate this information and give recommendations on changes to your cycling position and or technique. We will then make adjustments to your position, sometimes many times over, as we fine tune your position using our state of the art measurement equipment to attempt to find your ideal position. Once we have achieved an agreed position for the session, we will discuss a plan as well as review any technique changes and appropriate exercises to assist in easing and or preventing pain and injury. All of this information is documented and measurements, advice, and exercises are provided for your reference. Following your fit a follow up email will be sent which will include further information summarising your physiotherapy consultation for “bikefit” as well as some pictures of your position before and after adjustment with key areas highlighted. Read on below to understand some of the bikefit options available at Star Physio. Please send us an email or give our friendly staff a call if you are unsure as to which fit is appropriate for you. We would much prefer to have a bit more time to ensure that we can cover all of your requirements and give you an amazing experience than have to rush things and miss important details. We are sure that your investment in a great fit bikefit experience with Star Physio will reward you for many years to come! Star Professional “Bikefit”-(Road/MTB/Commuter/Track) with Gebiomized Saddle Pressure and Stability Analysis. Our professional fit by a physiotherapist is designed for the cyclist who wants to ride in a great position and be confident that their position will be efficient and comfortable on a road, Mountain, commuter or track bike. Due to the complexities of getting the front end of a TT of Tri bike set up correctly, additional time is required for these bikes. Please book a Star TT or Triathlon Specific Bikefit to allow us to assist you to get the most out of your bike. For road bikes with clip on bars, we will likely discuss with you why these only work for a very small proportion of the population (Read very flexible and no injuries) and we would again encourage you to allow us the additional 30 minutes for this. 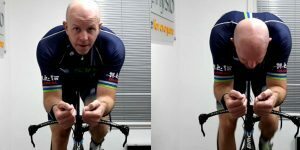 If you have significant injuries or significant discomfort on the bike which is longstanding or causing significant problems while cycling, we would encourage you to book our Star Professional Bikefit for Pain for Injury which allows an additional half hour to further assess to cause of your pain and carefully modify your position for this, as well as assist you in developing a plan for long term relief from pain in addition to our Professional Fit. Read more below. Your professional bikefit physiotherapist will determine the key features and requirements of your fit and depending on time, may choose to incorporate either saddle pressure mapping or foot pressure mapping. If you are having significant saddle or foot pain, or want to get the greatest possible information about your cycling position, biomechanics and stability, please book one of the fitting options below. Again, please send us an email or give our friendly staff a call if you are unsure as to which physiotherapy appointment length is appropriate for you. We would much prefer to have a bit more time to ensure that we can cover all of your requirements and give you an amazing experience than have to rush things and miss important details. We are sure that your investment in a great physiotherapy bikefit experience with Star Physio will reward you for many years to come with a comfortable, efficient position to keep you fit and healthy, (and fast too!) with minimised risk of injury! As per our Star Professional Physiotherapy Bikefit but also includes Gebiomized saddle pressure assessment or management or Gebiomized Foot pressure/force assessment. Let the Perth Bikefitting experts take care of your triathlon or time trial position. Aero fitting is inherently difficult and should only ever be undertaken by the most skilled and experienced physiotherapists. At Star Physio we have a love hate relationship with TT and Tri bikes because they are complicated and hard work, but the rewards for getting the fit right on these bikes are immense! It is also an area of Bikefitting that is often done badly, and unfortunately we see clients every week who have trusted and paid another fitter to provide a Tri/ TT fit, only to end up badly injured. Don’t let this happen to you!!! As physiotherapists we understand the injury risks associated with triathlon and the requirements of a specific position to not only minimise injury risk on the bike, but in the following run leg too! Poor Tri-Fitting Is A Drag! Triathlon also provides special fit-related challenges to the athlete and a delicate balance to optimise power, aerodynamics, function, injury risk management and comfort. Up to 80% of total drag is attributable to the rider – so it is right to focus here for the biggest slippery gains nut not at the risk of injury or pain! New information from international research from our friends in Canada and Germany now allows us to teach new techniques for gains of up to 5% with the right front end position without increasing injury risk. How does dropping 5-10 minutes off your half ironman ride leg sound just by getting the front of the bike right, without any negative effects on power or comfort or pain once trained?!!! In the past, best practice was to fit the athlete to maximise speed on the cycle leg. New triathlon fit thinking is about preserving the athlete for the run as there is evidence that run splits area better predictor of overall success. The right fit can protect your “springs” without winding up your hips and back too much during the bike leg for efficient power production and reduced injury risk. Do you understand the rules relating to the bike and the position of the saddle and bars on the bike? We do! There is no event on the bike where aero is more important, but this needs to be carefully balanced against the rules of the UCI, and your body’ stability to produce power in an aero position. The challenge in these fits is getting the balance right, all while staying within the guidelines of the UCI which are apparently designed to “level the playing field”. In reality, they do anything but this, and a clever Bikefit Professional knows how to manipulate this through the use of the right equipment, in particular the saddle, as well as the exemptions available to some riders. If you are serious about going fast in UCI cycling event, getting the right fit is critical, and staying within the guidelines is the key. Star Physio has a UCI measuring jig to double check all of these parameters during the fitting process. For triathletes, tune overall position to preserve athlete for the run-leg to utilise marginal gains for overall success. A large proportion of a Star Physio Bikefit is dedicated to learning about you, your history, your aspirations and also your body. This takes time but is the single most important part of the bikefit process from which nearly all of our decisions on your position are based. Once this is done, the fitting process is usually fairly straight forward and as such we are able to give you great value fits for additional or multiple bikes. We will fit an additional road, mountain, commuter or track bike on the same day for just $129. This price does includes saddle pressure mapping. For additional TT/Tri bikes on the same day, please get in touch and we will work with you to find the best possible solution. Most of our clients come to Star Physio because they are experiencing some sort of pain or injury. We highly encourage any cyclists looking for a bikefit because of ongoing niggles and pain to invest in the extra time we allow for the “bikefit for injury”. An injury does not need to result from a crash, nor be completely debilitating. If you have pain while cycling, booking a bikefit for injury will give us additional time to thoroughly assess your area of pain, and as well as accounting for it in the bikefit. We will be able to assist you with diagnosis as well as a plan to get it under control long term within the same appointment. The additional time will also allow for additional assessment on the bike using our WA first Dynamic Pressure Analysis at either the saddle of the feet which gives us information far beyond what even sophisticated high speed cameras can assess, to accurately identify important factors in your cycling related to your pain. With the information from our subjective and physical assessment, combined with our detailed assessment of your cycling technique and position, we use our skills as physiotherapists to work with you to determine the best possible position on the bike as well as a plan for long term resolution of your pain or injury. It’s aimed at cyclists with a current injury or a history of cycling injuries. It is a one on one fit which involves a comprehensive injury history assessment, musculoskeletal screening and an injury management/ prevention plan based on findings. Please bring any relevant scans or x-rays with you for review. Each session is 1.5- 2 hours long and includes either Gebiomized Saddle Pressure Mapping or Force Pressure and Force Mapping depending on the results from the initial assessment and discussions between you and the physiotherapist. By simultaneously assessing your movement with our high speed motion analysis in conjunction with pressure mapping technology, we can track responsive changes at the pelvis or even the foot in real time. Triangulating data and information in this way means that we can make more accurate predictions of issues that are causing inefficiency or malalignment. It also means that we can accurately analyse whether a positional change or foot/saddle intervention has resulted in more symmetry and cleaner movement patterns. This is great for the Star Physiotherapist but also good for the client’s confidence that issues have been objectively as well as subjectively improved. Call 08 9212 4254 to book a professional physiotherapy bike fitting for injury today. As per our Professional Physiotherapy Bikefit but also includes saddle pressure management, testing of multiple saddles as required and recommendation of correct saddle. Many riders struggle with saddle discomfort, often caused by areas of high pressure as a result of incorrect saddle choice or positioning. What begins as discomfort for some escalates to saddle sores, numbness and even erectile dysfunction in some men. Pressure mapping takes the guesswork out of saddle choice, allowing us to accurately measure how pressure is distributed on the saddle to objectively determine which saddle and position will result in the most significant increases in comfort and performance. Moving the saddle just 5mm can result in significant improvements. Numbness affects many cyclists and is often a result of poor saddle choice and position. Our Star Physiotherapists use their anatomy and pathology knowledge, combined with pressure mapping technology, to choose a saddle, position and advise on a posture which will unload sensitive nerve tissue. This can significantly alleviate and even eliminate numbness issues when riding and reduce the risk of more serious issues. Most riders would like to improve their cycling performance. Choosing the appropriate saddle can improve stability, economy and alignment. Pressure mapping provides objective feedback about where and how the rider sits, aiding our cycling analysts as they choose a saddle which matches your riding style and encourages good posture, thereby improving muscle activation and economy by reducing extraneous movement. Star Physio are the exclusive stockists in West Perth, Western Australia, of the amazing new range of saddles from Gebiomized. These saddles have been developed using the results of 50,000 saddle pressure assessments in conjunction with some of the best bikefit experts and cyclists in the world. We are proud to offer this range of saddles to assist our clients to find their optimal bikefit, in particular those with ongoing saddle discomfort problems. The potential of many excellent saddles is ruined by poor positioning. As little as 2 degrees of movement can modify poor posture to provide more comfort and better muscle activation. Pressure mapping allows our fitters to make precise adjustments and record their results in order to optimise the riders posture and performance. As per our professional physiotherapy bikefit, but includes foot pressure and force production management, recommendation of correct shoes and cleats. Also includes 20% discount off new shoes if purchased from TBE. Many riders suffer from ‘hot-spots’ or numb feet when cycling, particularly on longer rides. Previously, many of these riders relied on trial and error, making changes before testing them on longer routes, as the symptoms often take some time to manifest themselves. 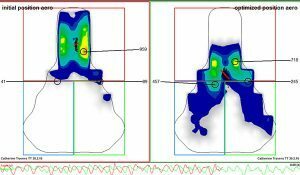 Star Physio’s pressure mapping service uses highly sensitive pressure pads within the shoe to immediately identify areas of high pressure and guide appropriate adjustments in shoe selection, footbeds, cleat position or wedge/shimming, in order to improve comfort. Pressure mapping at the foot is used by our cycling expert physiotherapists to adjust cleat position for optimal performance and minimised injury risk. Using our experience working with a wide spectrum of riders, we are able to adjust cleat position according to the riders anatomy, biomechanics and riding objectives; ranging from long-distance comfort to track pursuits. Shoe and footbed selection can reflect or correct a riders foot, depending on their anatomy and movement patterns. 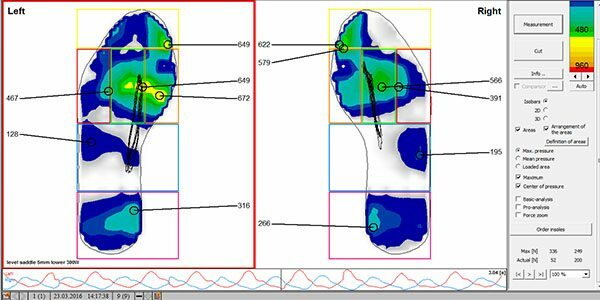 Following a thorough assessment, observation and measurement, our physiotherapists use pressure mapping to objectively determine which shoe and footbed combination will provide optimum comfort and performance. The Gebiomized foot pressure and force mapping system can accurately measure a cyclist’s ability to get power down to the correct part of the foot for comfort, efficiency and power and minimal injury risk. It can also assist in finding the most efficient or powerful position on the bike through careful analysis of the pedal stroke and pressure applied through this. Women make up approximately 10% of the cycling population and unfortunately only get this percentage of attention from most bicycle frame and equipment manufacturers! The good news is that things are changing and with female cyclist numbers on the rise, some companies are acknowledging the specific needs and geometry requirements of the ideal female bike. Star Physio have worked with a number of these manufacturers and can help you make sure you are on the right bike, or if required assist in getting some new equipment while you save for the dream bike to allow you to achieve your cycling goals, stay fit and healthy and minimise your risk of injury. Did you know that in a recent anonymous survey led by our great mate Phil Burt, from https://www.philburtinnovation.co.uk who was Great Britain and Sky Team Physio for over 10 years, it was identified that saddle pain was the number one reason a female cyclist missed a training session or race! Not knee pain, not back pain, SADDLE PAIN. Are you getting saddle pain? Are your neck and shoulders hurting while cycling? Having professional bike fitting physiotherapists and experienced cyclists and triathletes on staff, and using the only dynamic saddle pressure analysis system in Perth gives us a huge advantage in women’s Bikefit. We have worked with some of the best female cyclists and triathletes in the world and understand the requirements to get females comfortable on the bike, as well as having women-specific equipment available so you can get the most out of your cycling and ease any pain you are having, or reduce the risk of it occurring. Call 08 92124254 to book a women’s or Saddle Pain Bikefit session today. You will be so glad you did! Get a fit just like the best in the world, with comprehensive assessment of you biomechanically, including flexibility and strength, saddle pressure and foot force and pressure analysis and testing at multiple power levels with the above and high speed cameras. This is like our Professional Physiotherapy Bikefit but with our entire assessment arsenal at our disposal, and time for us to use our skills as physios with expertise in cycling to interpret this data. This is the fit you need when seconds matter, while still minimising your risk of injury, or while dealing with an injury while still preparing for an important event. Whether it is to have a crack at a world record, or just to beat your best mate to the coffee shop, you will leave this fit with a great position as well as a wealth of information to get the most out of your body and your bike. 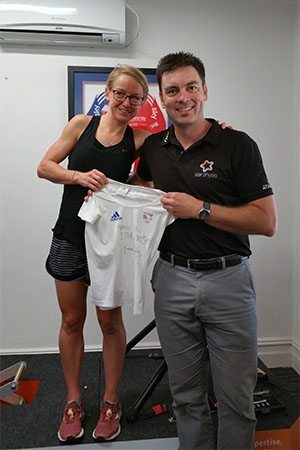 Star Physio work with some of the best in the world who trust us with their body’s as well as their bikes in their quest for Olympic and World Championship Glory. Bikefit review 40 minutes –Road/ MTB/ Track, 60 minutes TT/ Tri bike unless otherwise agreed. Bikefitting with a physiotherapist is often a dynamic process and requires adjustment and adaptation to new positions. Sometimes you will also be provided with “homework” or exercises to improve pain, minimise injury risk or maximise potential performance to be incorporated into the ideal position once mastered. For this reason we may recommend a review a period after the initial fit. Common times this will be recommended are when the initial fit is conducted with the major goal to ease pain or unload an injury. As always during these fits, the emphasis is on using our combined skills as physios and bikefit professionals. Star Bikefit and advice on purchasing a new bike. Physiotherapy Consultation 60-90minutes. $349 for full bikefit on existing bike and recommendations for new bike. Otherwise by negotiation- please call and chat to us! Due to the dynamic nature of cycling and the many factors that affect how you ride a bike (including flexibility, previous injury, ankle pedalling angle, spine shape), we need to see you on a bike (even your old one or a borrowed one) and assess you and your cycling history to give you the best advice. We can then discuss your cycling goals and bike “dreams” and have a look at some good options including sizing and geometry for your ideal bike to ride to pursue your cycling, fitness and health goals with a minimal risk of injury. Please book for a Professional Physiotherapy Bikefit after which we will give you a good indication of the measurements and position your new bike should be in. Your shop will be able to set up your new bike for you with the measurements we provide and then we will generally only require a 30 minute review for a fine tune once you have settled in. We love bikes and are generally up with the latest in technology and most bikes on the market. We also have a great network of friends in bike shops who will really look after you once they know you are a Star Physio client! Junior discounts for performance and injury prevention in our kids! We are proud to have worked with and watched some of the best juniors in the state become some of the best cyclists in the world, including Jessica Allen, Jai Hindley and Robert Power, and our own James Lewin from Triathlon. A number of these athletes have now joined professional teams and are fully funded and sponsored by other centres (e.g. WAIS) for physio and bikefit services elsewhere but they still choose to trust Star Physio for their bikefit and physiotherapy needs! We think that this is a pretty nice endorsement!